It's one of the most hard-wearing, versatile and masculine materials around. 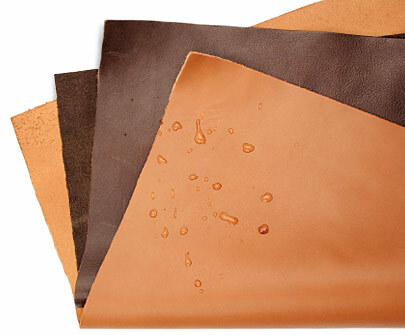 This series offers up everything you need to know about buying, wearing and maintaing leather. It's one of the most durable materials we wear. It's made to take a beating and that kind of durability will often cost you. But when chosen carefully and maintained properly, leather can be an investment that will pay off for a lifetime. That being said, nothing damages leather quite like water—it saps the suppleness from the skin and dries out the natural fibers, resulting in staining, stretching and cracking if not treated. Thankfully, a few simple steps will prevent moisture from permeating and eventually ruining your leather. But we should start by getting one thing straight: Waterproofing is something of a misnomer. You see, no matter what you put on your leather, it will never be fully waterproof. Water resistant is more like it. Protected, but not impervious to the elements. Make sure to test a small area before treating the entire garment, bag or shoe. Pick a discreet spot—under a jacket's arm, the side of the shoe's tongue or the underside of the bag—and apply a small amount of the protector to see how the leather reacts. There may be some slight darkening or discoloration. Let the waterproofer fully absorb into the leather before you treat the entire piece. You want to be sure of what you're getting into. And of course, you want to make sure whatever you're treating has been clean before applying the protector. A simple wiping with a damp cloth will do. Let it dry fully and then start applying your waterproofer. The average leather boot can soak up to a pound of water. This not only protects your leather from water, but it softens and conditions the finish, buffs out scuffs and restores sun-faded color. There are no harmful silicones, petroleums or solvents either. 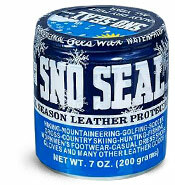 Invented back in 1933 to protect mountain climbing gear and ski boots, this isn't just for snowy conditions. The beeswax-based cream doesn't soften or condition the leather much, but it does offer the most protection from water (while still allowing leather to breathe). But be warned: This does darken the leather some. There are a lot of opinions against spray protectors. Many argue that the chemicals in them (namely, silicone) can dry out the finish and prevent the leather from breathing. But if you're looking for an easy way to cover a large area or treat suede, it's hard to beat a spray. Collonil is a quality waterproofer recommended by retailers and brands alike.